About three days a week you can find my family glutting ourselves on beans and rice at the Chipotle on the corner of Northwest Boulevard and Fifth Avenue near Grandview, Ohio. Oh, how we love Chipotle. Well, I love it. George indulges me. Though the food is great, the parking lot is a disaster. It’s like an experiment in Darwinism: kill or be killed. Once we make it through the carnage outside, we eat in—no takeout for us. If we’ve survived the parking lot conquest, we’re not about to turn right around and surrender our prize. And though we know as well as anyone that you take your life in your hands trying to find a space during busier hours, that’s really not an excuse to use one of their two handicap spaces. 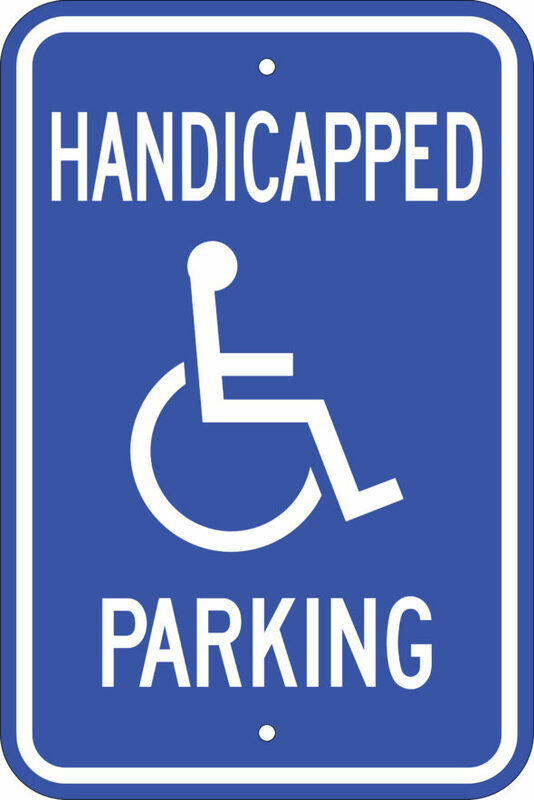 Sometimes as we eat we watch out the window and marvel at the number of people who pull into the handicap spot closest to the door and walk in to order. It’s like a revolving door for parking law violators: The minute one pulls out, someone else pulls in. And then one day we witnessed a magical event, a marvelous comeuppance. A driver with a handicap plate pulled in directly behind the illegally parked car, blocking its exit. Our new hero just shut off the engine and came in to order dinner. We were hoping for a show. What would the first driver do? Come back in and ask, table by tale, who had illegally parked behind his car that was illegally parked? Or would he just sit and contemplate his actions while he waited for the other driver to leave? We didn’t get to see the outcome, but the mom in me hoped for the latter. I do have some empathy for those Chipotle lawbreakers, though. I’ve done it myself. Not intentionally, but, in retrospect, how did I not realize that the space at Metro Fitness was designed for handicap parking? Sure, the paint on the blacktop had faded, but how often is it just a coincidence that the spot closest to the door is always open? At one point a patron asked me if I realized I was parked in a handicap spot. This was when the illogic of the situation hit me, and I moved my car—and haven’t made the mistake again. But still, it can be a mistake—unless there’s a big metal sign advertising the handicap space. For instance, not long after the Chipotle incident, we pulled into a BP so George could get air in his tires. Our son Riley and I sat bored in the truck while George went into the convenience store to get the hose turned on. As he walked past a car parked illegally, he made accusatory eye contact with the passenger. These handicap-space thieves at BP are particularly objectionable because they can’t possibly be doing it by accident. A metal sign stares right into the windshield. There’s really no missing it. In fact, the sign is so obvious that George—subtle as ever—had no trouble finding it to smack it with his hand as he stared again into the illegally parked car on his way back to the air hose. Yikes. Riley and I rolled the windows down so we wouldn’t miss anything. The scene was awkward, which seemed to bother George and this parking violator not one iota. They traded jabs awhile longer and, eventually, the woman got into the driver’s seat and moved the car to a more appropriate space. Situation resolved, mercifully, until the driver came out. I swear to God, that’s what she said. Maybe it was his cape. They drove off in a peculiar huff, but I was just glad it didn’t come to blows. George would never hit a chick, which means it would have fallen on me to handle the situation. I may have principles, but no traffic issue means enough to me to take a punch.